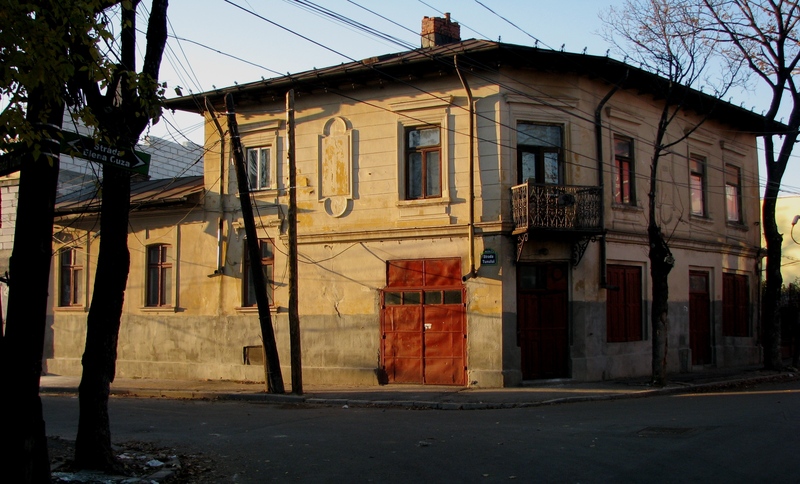 Late 19th century corner house (construction date inscribed on the building is 1895), with ground floor store or workshop and owner’s dwelling upstairs, on a secluded street lined by trees in southern Bucharest. The beautiful cast iron balcony above the entry door displays the owner’s monogram. O casa de colt cu pravalie (sau atelier) de sfarsit de secol 19. Anul 1895 este inscriptionat pe cladire. La etaj se afla locuinta familiei. Casa se afla in apropierea bisericii sf Nicolaie Brosteni in zona de sud a orasului, pe o straduta izolata marginita de arbori inalti.